While my mother was away, these lovely lilies bloomed in her garden. I always look forward to their annual blooming. Once they die, there is nothing to show that they were there. The "miracle" never ceases to amaze me, year on year. Flowers of India gave me this information about the blood lilies. Blood lily is a beautiful flowering bulb from tropical Africa. The spectacular flowerhead is a huge spherical umbel consisting of up to 100 flowers, held clear of the foliage at the end of a solitary stem. Each plant will produce only one flowerhead in a season. Blood lily is a bulbous plant with leaves on short, speckled stalks. The flower stalk bears a rounded inflorescence, 8-12 cm across. The plant may live for many years and will flower annually indoors. During the growing season the plant needs bright light, if possible direct sunshine for two hours daily. During winter dormancy, light is unimportant but temperature should not drop below 13 degrees centigrade. Bare branches take your mind to winter in foreign locales. The blooming pink flowers serve a pleasant contrast. A case of roses in the middle of thorns? Or more appropriate to this arrangement, the pink flowers happen to be asters heaped along with dry branches. In the realm of ikebana, pink signifies grace and femininity. But nevertheless, the arrangement conveys the same sense of discovering joy in the middle of sorrow, or a spark of light in the middle of desolation. Molly Cherian, who created this arrangement, calls it ‘Windswept?.’ The cream and pink shades of the ceramic jar serve as a great foil to the pink asters, accentuating their colour appeal. Well actually, Molly has consciously used the pink asters to continue and complete the pink design on the vase. But you could experiment with un-patterned ceramic vases or terracotta and other containers too. In case you are using a tall vase, the bird of paradise plant may be used too. Windswept is a composition of form and colour, using line as a link. Come to think of it, it is a very simple arrangement, despite the profound psychological premise it suggests. The effect can be replicated with other colours and varieties of locally available spectacular flowers like chrysanthemums. However, the flower clusters should best remain small for maximum impact. The challenge is in arriving at a natural sway for the dry branch assembly. Notice the container? Yes, it is a copper water pot. In fact, using imagination and thinking out of the box, you can fashion vases out of a range of objects… the sky is the limit. In fact, you can even improvise upon the half of a tender coconut and create a vase out of it! That is how innovative and enterprising you can get with Sogetsu Ikebana. In this arrangement by Sogetsu Ikebana teacher Malathi Pandurang, the twigs branching across space towards the onlooker let out a sense of wilderness. Malathi has also used vine, ginger lilies, Ixora branches, and Heliconia in the arrangement. The sturdy Ixora branches do stand out and dominate the arrangement, but it is the copper pot which actually inspired the entry of the Ixora branches. “I wanted to use something sturdy to complement the deep colour and texture of the copper pot, which is what the Ixora branches achieve. The same effect can be arrived at by using guava or lemon branches, while lighter grassy material wouldn’t work”, explains Malathi. Heliconia entered the scene because they are locally grown flowers, which again gels well with the traditional tag and antiquity of the copper pot. Again, the deep red ginger lilies and the tender coconuts accentuate the traditional tone of the arrangement, while the vine connects the whole arrangement together. Ikebana delight: The predominant materials are bamboo sticks, coloured bamboo, Dressina leaves and Asia lilies in a colourful mixture. Can an ikebana arrangement move off the table and take a place on the floor? Why not, progressive schools of ikebana encourage you to let your imagination soar, and if the arrangement zooms up in size and space, well, why not? That is, if you have the space. 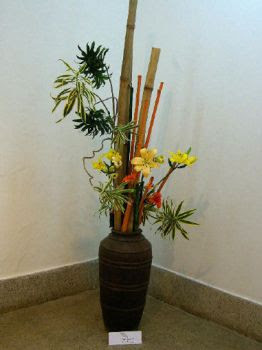 In the arrangement being considered here, the predominant material are bamboo sticks, coloured bamboo, Dressina leaves and Asia lilies in a terracota pot. The theme Ambika had in mind was ‘colours of India’, and consequently the colour composition - green, gold and orange. “I tried to complement the earthy terracota pot with the brown of the bamboo”, Ambika says. “When I made the arrangement, the bamboos were up straight, and not leaning to one side as they are in the image. Also, the yellow Asia lilies were placed at varying heights, to give a three-dimensional effect”, says ikebana enthusiast Ambika Chandrasekar. The bamboo sticks were wired around (with thin metal wires available at hardware shops) and placed snug into the terracotta pot. Tall vases carry large arrangements well. One can also do a more horizontal interpretation with the same materials, by exploring alternative sizes and positioning, and perhaps introducing a few new flower varieties. “The strong lines of the bamboo are softened by the elegant curves of the Dressina, and the Asia lily flowers add an element of drama and focus to the composition”, Ambika says. While Ambika has used variegated Dressina here, brown and green Dressina varieties are also available. Dressina is grown commonly in gardens, while the yellow and orange Asia lilies may be obtained from the florist. 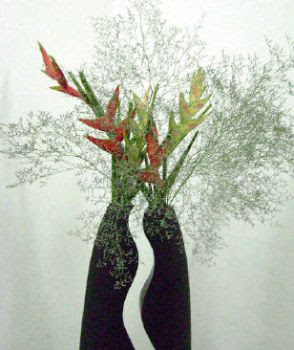 Seen as one: Ikebana can be used a pair to create a unitary effect. It is a twin core, where you can read two as one and one as two. This particular twin-core ikebana arrangement rooted in plant material leads our thoughts into philosophic material… concepts like dual self, virtual reality and so on. "The shape of these Sri Lankan ceramic vases inspired me to use them as a pair", says Sogetsu Ikebana teacher Malathi Pandurang. While the inner curving outlines of the two vases complement each other to create a unitary effect, it can also be read as a marked split. The perfect balance between the two vases enables them to be read as one, though they are two. Two kinds of plant material have been used too. The solid and vivid heliconia and the cloudy and fragile limoneum flowers. "It is a very simple composition, actually. After putting the two vases together it looked too solid and rock-like, so I tempered it with a cloud of tiny limoneum flowers. And to complement the container, I used solid looking heliconia flowers", Malathi explains. As Malathi Pandurang points out, the possibilities of working with two vases are endless. You can place the vases one behind the other, at an angle, etc, and accordingly opt for different kinds of plant material. For instance, you can create a linear composition, using a tall slender vine or sturdy zigzagging branch and bunch up a mass of vividly coloured chrysanthemums or alstromeria over it. Grown widely in Ooty, these flowers are available with florists. Enjoy these lovely zinnias! While the colours are stunning, what I loved the most were the delicate "brush strokes" and designs in the centre of the flowers.